We have seen it in countless movies and tv shows. The protagonist walks in and sees someone they care about lying down and unresponsive. This hero immediately rushes over to see if they are alive by checking for a pulse, but that may not be enough information anymore. Research into left ventricular assist devices (LVADs) have shown that we do not need a pulse to live. Most of us have heard of pace makers, devices that can be used to aid or replace the electrical system in the heart. The electrical signal is responsible for causing muscle contractions that lead to the heart beating and the movement of blood throughout the arteries and veins of the circulatory system. Pace makers can be used when the only problem is with the electrical signal. With Heart Failure, the muscle of the heart is weak or damaged and therefore unable to sufficiently pump blood throughout the body. In this case, the problem requires more than an electrician; we need a plumber to work on the blood flow. Many cases of Heart Failure do not require the replacement of an entire heart, but rather, the heart just needs some help. LVADs have been providing this assistance for a few decades now. They provide an alternative path for blood to travel and be pumped throughout the body. 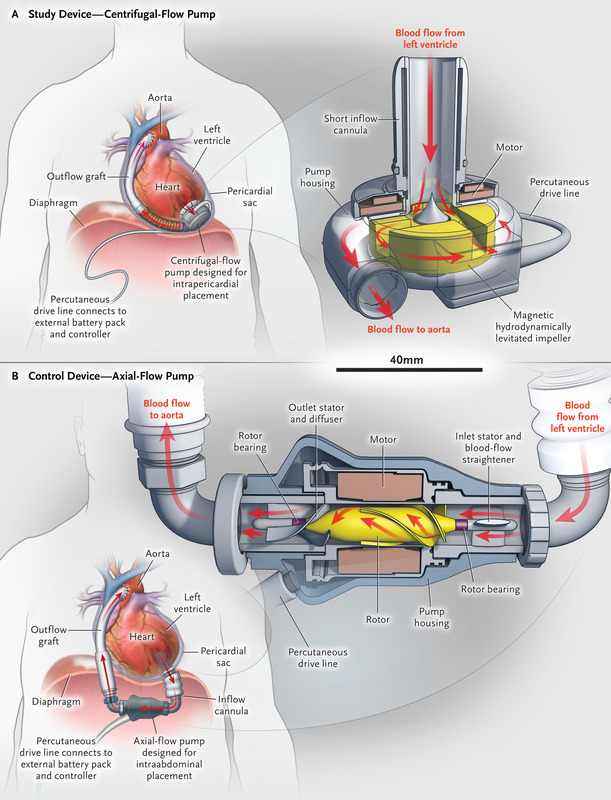 Initially these devices attempted to mimic the pumping action of the heart by using positive displacement pumps. This style of pump has a chamber that fills with liquid and is forced out by the chamber reducing in size. While these pumps worked to an extent, there were still problems such as size and reliability. A better pump required marching to a different beat. Centrifugal and axial flow pumps are different than positive displacement pumps and work by the rotation of an impeller blade. The blood flowing through such a device will move continuously and not have the natural beat pattern observed in our heart. The full effects of removing an individuals pulse are still under investigation, but what is known is that these devices can be used to help prolong an individual’s lives successfully. If you come across someone alive, but without a pulse, they are probably not a zombie. They likely are closer to a cyborg, with a mechanical device operating in place of their heart. Published by Spell your Science on October 8, 2018 at 7:45 AM under Health. 0 comments.